May 20, 2014 – Laphroaig distillery manager John Campbell has been busy. 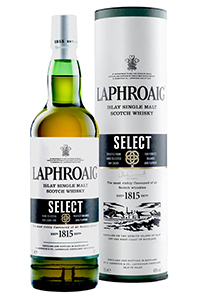 In addition to running daily operations at the Islay distillery, Campbell personally selected the casks for Laphroaig’s newest expression, Laphroaig Select. The no-age-statement single malt is being rolled out worldwide in limited amounts through whisky specialist shops, though there are plans to make it a permanent expression over time. The expression is also being sold as Laphroaig Select Cask in Australia. “This was John’s idea,” said Laphroaig global ambassador Simon Brooking in an interview Tuesday evening. “This is an homage to Ian Hunter, one of the distillery managers who had a big impact on the whisky and the popularity of Laphroaig…he traveled globally, and was really the first distillery manager to do so for Laphroaig. It’s the reason why Laphroaig is as popular as it is in Sweden and the United States here today.” Hunter became Laphroaig’s manager in 1908 when his parents, aunt, and a cousin inherited the distillery from Alexander Johnston. He eventually wound up owning the distillery, which he bequeathed to the equally legendary Bessie Williamson upon his death in 1954. Campbell created the blend for Laphroaig Select from four of the distillery’s existing expressions, Triple Wood, Quarter Cask, PX Cask, and the Laphroaig 10-year-old, with final maturation in new American Oak casks. The whisky is bottled at 40% ABV with no caramel coloring, and will sell in the UK for a recommended retail price of £34.99 GBP ($59.00 USD) per 700ml bottle. Approximately 12,000 bottles will be available in the US later this summer, with pricing for the 750ml bottles still to be announced. Tasting notes are not available yet, but will be posted when a sample becomes available. Laphroaig’s other new malt will debut at the distillery during the upcoming Islay Festival of Malt & Music, which begins this weekend. The annual Cairdeas Feis Ile bottling for 2014 was finished in an Amontillado wine cask. Pricing has not been announced yet, but Beam Suntory has confirmed that around 1,000 cases will be available in the US later this year, and it’s also expected to be available in other markets as well. Editor’s note: Thanks to Marcel van Gils at LaphroaigCollector.com for historical information on Ian Hunter. This story was updated on May 22 with additional information on the Cairdeas Feis Ile bottling’s US availability.